Cold temperatures have finally made a comeback after a scorching summer (by glacial standards) up on the Grande Motte in Tignes. It well documented that glaciers in Europe have been hit hard by above average temperatures and heatwaves on the continent during the summer. Many consider the start of September to mark the beginning of Autumn and most notably the end of Summer! 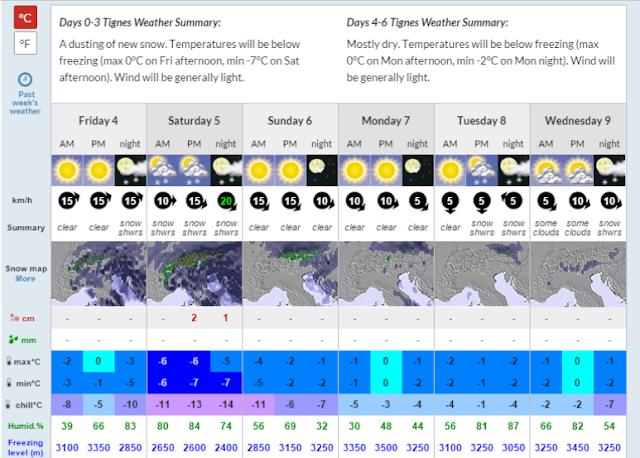 And it seems like mother nature has also subscribed to this in bringing cold temperatures over the Alps. Here's the forecast for the next 6 days in Tignes, which shows freezing temperatures dipping as low as 2400m on Saturday night. Temperatures have also dropped in North America. Whistler Blackcomb (BC, Canada) among other resorts received a dusting of snow on the upper mountain which lead to some Americans and Canadians getting a little too excited on social media. The saying of 'snow in September you will never remember' couldn't be more relevant, but then I suppose what is the harm in dreaming! For those still in search of a summer snow fix then the southern hemisphere still remains the best bet after what has on the whole been a bumper season.